In hindsight, sharing a bottle of cheap red wine before a red-eye flight to a new country probably wasn’t the smartest idea. 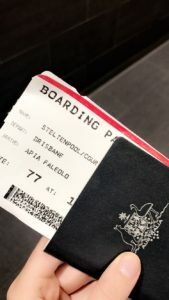 However, as Danni and I giggled our way through boarding, covering our purple teeth with our hands as we passed other passengers, we didn’t care – the journey to Samoa had begun! Resisting the urge to continue drinking red wine on board, we relaxed as the flight took off in the darkness of the night; knowing that when we landed, we’d be in beautiful Samoa. We arrived at Faleolo International Airport in the dark at about 5:00am local time. Delirious due to lack of sleep, we slowly stumbled our way through immigration and baggage claim, relying only on the excitement of our arrival to keep us awake. After clearing customs, we rubbed our bleary eyes and headed outside the terminal. We were a good couple of hours early to pick up our hire care, so we figured we’d chill out in the airport until the car rental place opened. As we wandered aimlessly outside, we realised that there was no place to chill at the airport; there was nothing but taxi drivers, airport transfer drivers and tour operators, all with eyes glued to the arrivals gate waiting to pounce on their next customer. Suddenly aware of the many eyes upon us, Danni and I played it cool, and walked confidently through the tiny arrivals section of the airport like we knew exactly where we were going. I grabbed our car hire confirmation from my backpack and realised that luckily, the rental place was open and we could pick up the car early – phew! We were bloody tired. With finding coffee as our new biggest priority, we picked up the pace and increased our speed from 35km/hr to a modest 40km/hr, and trudged along in the darkness, watching ever so patiently for the first glimpse of sunlight. As we slowly navigated our way through the Samoan villages, first light began to appear, giving us a better sense of our surroundings. Huge mountains appeared on the right side of the island, remaining dark against the glowing dawn sky, and we could finally see the Pacific Ocean quietly lapping the shore to our left. As we drove through the quaint Samoan villages, we waved at the early rising locals walking along the road, no doubt on their way to Sunday church. We continued down the road at a modest pace, and we began to notice our surroundings getting larger in size. We soon came to realise that we were approaching Apia. While not a large city by Western standards, the capital of Samoa was quite populated for the small Polynesian island. 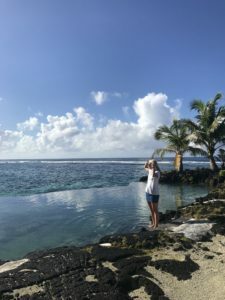 We navigated our way through the streets, relying on a small map in Danni’s Lonely Planet guide, until we reached the Sheraton Samoa Aggie Grey’s Hotel & Bungalows. Overlooking Apia Harbour, this colonial-style hotel looked like the perfect place to grab a coffee, so we parked our little Yaris across the road and wandered sleepily in the front door. Comfortably seated in the beautiful marble lobby, we breathed a sigh of relief. We were in Samoa! We had coffee! We had free WiFi! The sun was rising! Sipping our delicious lattes, we quickly sent messages to our families letting them know of our safe arrival to Samoa, then relaxed until the sun had fully risen over the island. It was time to head to our home for the next week, Sa’Moana Resort Beach Bungalows, located about an hour away on the south side of Samoa. Once we’d been sufficiently caffeinated, we left the Sheraton en route to the other side of the island. We’d been given another map by one of the friendly staffers at the Sheraton, so we felt a bit more confident in where we had to go. 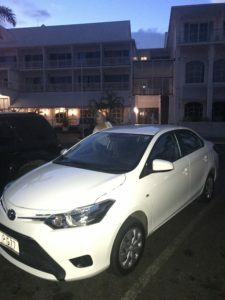 Since the sun had risen, it was my turn to take the wheel of our little car, who we’d affectionately nicknamed ‘Whitey’ (very original, I know). As we made the return journey along the same road we’d driven into Apia, we realised that we were in a whole new world. Where we’d driven in near darkness was now fully lit in a vibrant display of colour, with everything appearing bright and animated. It was hard to concentrate on driving when I was surrounded by lively, yellow-tipped hedges, deep burgundy shrubs, and countless green coconut palms. The locals we’d seen earlier in the morning were now making their way home from church, and waved at us with enthusiasm; huge, friendly grins decorating their happy faces. Waving at the locals wasn’t just a novelty for us, and was something we got pure joy out of during our entire stay on the island. Everyone just seemed so happy, and the feeling was contagious! After a few wrong turns and driving past the turnoff we needed to go down a couple of times, Danni & I had finally made it to the Cross-Island Road, one of two major roads running straight down the middle of Upolu. If you’ve ever visited Samoa yourself, you will know that the whole street sign/signs in general thing hasn’t really taken off yet, so trying to navigate your way around with nothing more than a tourist map is quite the challenge. Even in our sleep-deprived state, we found it to be an adventure, and we laughed every time we went the wrong way (which was almost every time). Eventually, we made it to the turn-off to Sa’Moana Resort, which luckily, was actually signposted. The road to the resort was a six kilometre, unsealed dirt path with plenty of chickens, pigs with piglets, and locals milling about on the sides. 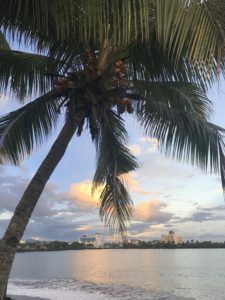 We carefully navigated each and every bump, and finally made it to the coast, where the shoreline was dotted with coconut palms – the signature of a tropical island. Noticing the colourful bungalows lining the beachside, we cried out in happiness – we were finally there. Upon arrival, we immediately jumped in the volcanic rock infinity pool, and washed away the past 24 hours in the cool ocean water. We’d made it; the journey to Samoa was complete.